So I passed by a sign that said the Damen entrance to the IMD stop will close on the 6th to make it accessible. To my surprise the same sign states the Paulina entrance is accessible now. So what did they do to make it accessible? Put up a wheelchair gate? If that is indeed the case then they could have a bunch of forest pk branch stations theoretically become accessible. So why don't they do that? Yes, the rotogates were replaced with two wheelchair gates. A temporary agent booth opened as well, along with blue screening placed over the chain link fence on the ramp. Which raises the question whether this is temporary (from you picture, it looks it), although many of the Green Line/Lake stations were made accessible by using ramps. Maybe the Congress ramps are just too long. I seem to remember UIC' s Halsted ramp being completely rebuilt and putting stop gap level areas of the ramp so momentum can't pick up on a wheelchair and the wheelchair loses control and goes flying down the ramp. Those ramps are long and speed can really build up fast. Did anyone notice if this was done at Paulina? There hasn't been any work done to the physical structure of the ramp at Paulina. I'm speculating that the wheelchair gates were put in at Paulina so that Damen can be closed for stationhouse remodeling and reconstructing the ramp (which I would imagine would have landings added and perhaps widened like at Halsted). Then once Damen is reconstructed, Paulina could be closed and have the stationhouse and ramp worked on. I wonder how the Ogden stationhouse plays into the construction schedule. CTA's website states that they want to be finished by "late 2017", but they also started about four months later than what was stated. The Intergovernmental Agreement (because this project is funded with TIF money) states that construction needs to be finished by the end of 2018. I dont know how wise that was then to put the wheelchair gates in with a long ramp. Paulina I think is one of the longest. You would think that poses a safety hazard. I would be very concerned if I worked in safety or the law dept. I wonder how they got around the handicapped inspection prior to opening it? On the other hand if it's not an issue why not put those gates in at other forest park branch line stops. The stations could have wheelchair access even though it is generic. Paulina might be the longest, but that probably makes it the least steep as well. Though I'm not sure if the duration of downhill rolling is more important than the intensity of downhill rolling. I think putting wheelchair gates at all of the stations is fine unless they have only wheelchair gates. I personally prefer going through conventional turnstiles. It all depends on the gravity of the object versus its friction. A 200 pound man could probably roll down that incline and pick up speed to about 15mph. Most likely though the wheelchair would hit the side of the ramp and scratch up a persons leg or turn over send them tumbling down the way. a bike as a comparison over by me using the addison/narragansett hill can increase to about 20-25 mph. That would be a blocks duration about the same here although the incline is steeper. I still have a new wheelchair in my garage. (Relatives passed a few years ago.) For an experiment we can roll busjack down the incline and see how fast he goes!! Lol!! Really though its probably not a laughing matter and if I was in a wheelchair I wouldnt use that incline for the fear i would travel down it like those kids in dumbass the movie!! For an experiment we can roll busjack down the incline and see how fast he goes!! Lol!! Nope, but a thorough understanding of vectors and Newtonian acceleration calculus would. Unfortunately, that wasn't presented to me in an integrated manner in the 11th grade physics class, although I do recall it had to do with numbers squared (note that acceleration, including with respect to L motors, is expressed in units like miles per hour per second). You know if I was CTA i would put out a direct order that the CA assists anyone in wheelchairs up or down those ramps. I know it's policy a CA has to go and get a ramp for a wheelchair bound person to fill in the gap between trains and platforms but here they need to extend the rule. Only way to know is to ask a CA, only problem is last time when I was at Paulina it didn't have a CA, I believe only Damen and Ogden did. It might have one now because it doesn't take a pop quiz to know they are going to have fare jumpers now. I believe they had a rotogate before. because it doesn't take a pop quiz to know they are going to have fare jumpers now. I believe they had a rotogate before. 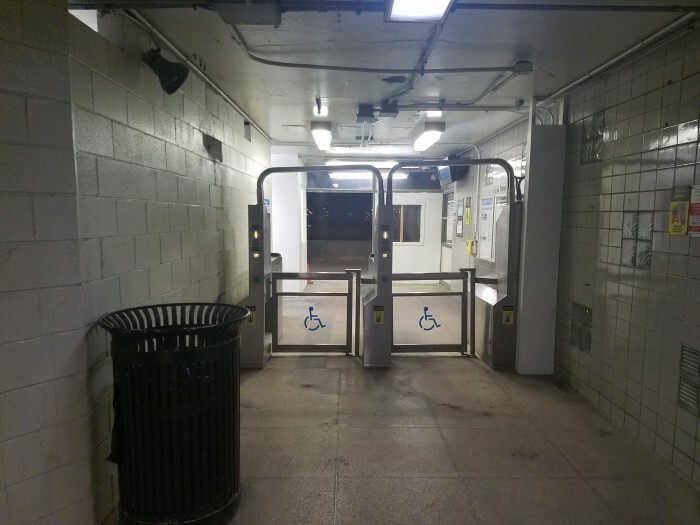 I was going to mention that in connection with @MTRSP1900-CTA3200's post, at least to the extent that someone could hold the handicap gate open, but then figured it was a risk at any accessible station. BTW, the acceleration rate of gravity is 9.8 m/sec2 or 32 ft/sec2, but you would have to vector the angle of the ramp and take air resistance into account. I was reading something that said an object on a 30 percent incline could travel at 4.5 meters per second. It's complicated I know, that's why professors lecture on stuff like this. I don't remember a question like that on my ACT test. The math part was fun. It's possible, but I don't see that happening for some reason. I was at Belmont after visiting a friend and I elected to go through a normal turnstile after watching someone go through the wheelchair gate. It looked like it didn't close that fast, even without human intervention. I actually considered bringing that up in my original post, but I went on the assumption that the gates close by themselves. What's bad about the gates is they have that blue handicapped button that allows someone to override the gate. What they really need is some kind of sensor on the gate like an electric eye that can track a person going the wrong way through a gate and when they go through announce they are fare evading like Pace does with its back door saying your too close. I think that would be ingenious because it shames the gate evader, tips off the CA if they are not around and possibly serves as a deterrent against this. Looks like heavy construction is ready to begin at the Damen entrance. Jersey barriers were set up in the street and some equipment was on sight. Since we last spoke of this particular station project here, I will report here that CTA announced in today under the most recent weekday service change updates that the Damen entrance to the Illinois Medical District station will finally reopen on next Friday, July 21st. Now CTA can soon remove the service alert announcements on the #50 Damen buses that the entrance is closed between February and May 2017 (yeah the original plan was that the entrance would only be closed till May ). Damen entrance delayed until Monday morning. There was some final work being done plus CTA has weekend work going on at the IMD station itself resulting in one tracking of the Blue Line between Western and Halsted planned during the weekend. CTA service alert for Ogden and Paulina has an end date of Monday, Aug. 20, 2018 now. I walked past the other day and Paulina more or less looked ready to go while there was a little more work to be done at the Ogden house. I wonder if the elevator is ready for primetime. EDIT: This alert claims ADA accessibility at all three entrances, so the elevator is opening. Everything is almost ready except for the electricians finishing up the wires.